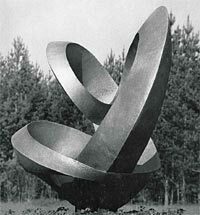 THE SCULPTOR NIKOLAI SILIS WAS BORN IN 1928 IN MOSCOW, IN THE GRAUERMAN MATERNITY HOSPITAL ON THE ARBAT: THE SILIS FAMILY LIVED NEARBY, IN A COMMUNAL FLAT ON GOGOLEVSKY BOULEVARD. HIS FATHER, ANDREI SILIS, WAS SHOT IN DECEMBER 1941, ON TRUMPED-UP CHARGES, IN THE UKHTIZHEMLAG LABOUR CAMP. HIS MOTHER, YEKATERINA, MIRACULOUSLY SURVIVED THE BLOCKADE OF LENINGRAD, WHERE THE FAMILY HAD TO MOVE AFTER THE FATHER'S ARREST. YEKATERINA SUCCEEDED IN SENDING HER TWO SONS, THE OLDER RUFIM AND THE YOUNGER VADIM, AWAY TO RELATIVES LIVING NEAR THE TOWN OF KALININ.